Yes, you can have your wedding and reception at the Buffalo Bill Center of the West! Make your wedding even more memorable and extraordinary by holding it in one of many areas of the museum. A premier location: the south-facing window in the Whitney Western Art Museum. The raised platform at the end of the gallery faces a breathtaking view of the bronze sculpture Buffalo Bill�The Scout and the surrounding mountains. It�s one of many �one-of-a-kind� areas at the Center. he Chamberlin Inn is the perfect place for a romantic wedding. We can accommodate wedding ceremonies with up to 75 guests and offer several beautiful options for your wedding ceremony. The perfect wedding has to have a perfect wedding location and K3 Guest Ranch Bed & Breakfast in Cody, Wyoming has it all! With both indoor and outdoor ceremony options, lodging accommodations for an entire wedding party, and Wyoming�s Rocky Mountains as a backdrop K3 is Cody�s premier wedding venue. Kathy Singer Photography Boutique Portrait and Wedding Studio serving Cody and Northwest Wyoming. It�s the most important day of your life and Accents Floral is here to help make it perfect! You�ve got the wedding dress and wedding cake and now it�s time to find the perfect florist! Accents Floral can design spectacular centerpieces to complement your d�cor, as well a bouquet you�ll be proud to walk down the aisle with. We also design corsages and boutonnieres for your entire wedding party. For wedding flowers in Cody, WY look no further than Accents Floral! Have you always wanted a beautiful mountain wedding? Now`s your chance to book your wedding date at Rand Creek Ranch guest ranch in Wyoming. We will work with your wedding planner to make your day a once-in-a-lifetime memory. Wayfarer`s Chapel is located on the Northfork Highway 8 miles from the East Entrance to Yellowstone National Park. This outdoor chapel offer a special place of worship to local residents and visitors. Services are lead by Christ Church`s Worship Leaders and are held on Sundays at 10 am, June through August. The chapel is also available for weddings and special services. Beartooth Floral and Gifts has a legacy here in Cody Wyoming of a premium floral shop and gift store. Under the new ownership of Frank Kraut and Karisa Hanson, we hope to continue the legacy by providing top of the line florals and plants along with a unique gift and antique line. We personally select interesting and rare fresh/preserved flowers, and indoor/outdoor plants. We strive to stay on the cutting edge while still honoring old traditions. We guarantee our product 100% and will replace anything no questions asked. We invite you to check out our inventory as we always have a cooler full of arrangements for purchase. We also love to do custom orders and would love to work with you to achieve your full satisfaction. Mooncrest Lodge is a breathtaking venue for meetings, banquets, weddings, family reunions. 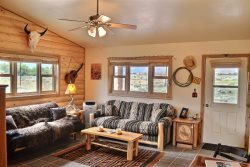 We are a working cattle ranch on private property; therefore, we do not operate as a dude ranch or hotel/lodging facility. We are located 9 miles north of the highway to Yellowstone National Park. It is private and secluded. Guests are allowed full use of the lodge for their event. Guests arrange their own catering and decorations, which allows for your personal touch for your particular event. Guests are responsible for all decorating and clean-up. We do have an outdoor location that can be used for an event. The Lodge can comfortably accommodate 75 people for an event. There is a state park near the private road for campers. ATV�s, motorcycles, campers are not permitted on the private road. We are located in a non-cell/non-Wi-Fi area. Spurlicious Custom Cupcakes & Cakes was started in 2008. It came from friends encouraging me to take my cake decorating to the next level and turn it into a business. At this point I had only baked and decorated goodies for family and friends. I`ve been baking my entire life. I remember standing on a chair in the kitchen rolling out cookies with my mom as a young girl. In 2012 we shortened the company name to Spurlicious as our customers were asking for all types of baked goods. ? The name Spurlicious is a combination of our families interest in the great sport of rodeo, living in the western town of Cody, Wyoming, and enjoying delicious tasting food. Events Rentals is committed to making your next event beautiful and hassle free. With services ranging from rentals, delivery, or setting up your event, our team has years of party service experience. Whether its a small get together, a birthday party, family reunion, wedding, seminar, or any event, we are here to serve you. Whether planning a festive celebration, an elegant wedding, an important corporate event or simply entertaining at home, we have earned the reputation for unparalleled taste, service and style.